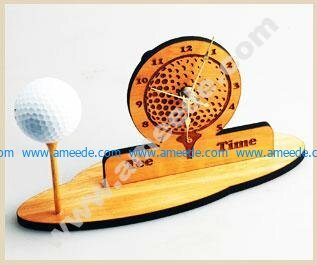 Father’s Day is approaching, but this clever desk clock makes a perfect anytime-gift for the millions of golf fans out there. A clean and simple design make this project both fun and functional. Not into golf? Use the design as inspiration to create clocks with different sports themes – baseball, football, soccer – the possibilities are endless! To create this clever clock, just follow the instructions below. 14.5″ x 4.5″ plank of Lyptus, 1/4″ thick. Available from Colorado Heirloom. Lyptus is the trade name of a wood made from a hybrid of two species of Eucalyptus tree: Eucalyptus grandis and Eucalyptus urophylla. Developed for quick harvesting, Lyptus is an environmentally-friendly alternative to traditional hardwoods. Clock works – available from craft and hobby stores, we got ours at Hobby Lobby. Make sure the dial thickness is at least 1/4″ to ensure it fits through the back of the wooden cut-out.